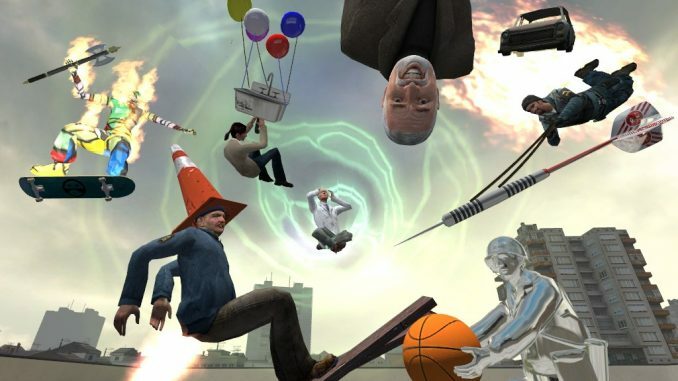 Garry’s Mod (GMod) is a physics sandbox game that uses Valve’s Source Engine, created by Garry Newman. Garry’s Mod requires the user to own at least one game on Steam based on the Source engine, such as Half-Life 2, Counter-Strike: Source, Portal, or Team Fortress 2 in order to play. However, you are limited to the props available in the Source Engine games you own, so this should be considered a minimum requirement. WTF is up with the interface to install it? Is it checked before you release it or is the random jumbles of crap intentional? I enjoy the site but WTF? Happy the it works for you… happy gaming! Can you please let us know more about your problem? what do you mean half life? did you download half life in our site? i love grarry mod but went i download it and it done and i cannot start it ???? what do you mean did you finish downloading the game or finish installing it? but went i waiting i play shooting game and watch youtube is it long because that ???? we are sorry as we have stated on the comments we do not know much about this game as someone just requested this so we posted it… anyway you can try to run the game as administrator this might fix your problem. When I start it. it says missing interface and I waited 1 hour.is there something wrong with the download or something. This pack contain base content from games: Age of Chivalry, Alien Swarm, Counter-Strike Global Offensive, Counter-Strike Source, D.I.P.R.I.P, Day of Defeat Source, Dino D-Day, Dystopia, Half-Life 2 Deathmatch, Half-Life 2 Episode One, Half-Life 2 Episode Two, Half-Life 2 Lost Coast, Half-Life 2, Half-Life Deathmatch Source, Half-Life Source, Left 4 Dead 2, Left 4 Dead, Nuclear Dawn, Pirates Vikings and Knights II, Portal 2, Portal, Team Fortress 2, Zeno Clash, Zombie Panic Source. This pack design only for my Garry’s Mod game build (http://update.bruss.org.ru/Garrys%20Mod.torrent). Work on any other build or steams not guaranted. Run Setup.exe and install to game dir (near Garrys_Mod.exe/hl2.exe file). * Update some content (tf2, csgo and etc). I have already got the game now.But thank you for telling me about the packs and new download and stuff. You are always welcome King… happy gaming! Thank you for this working game. I have search for this and only found none working downloads. will browse for more in your site.